Thankfully, coordination with law enforcement continues to improve, with a number of high profile SIF investigations resulting in criminal prosecutions in the United States and overseas. 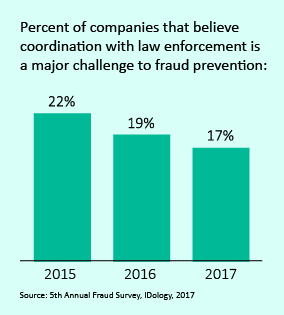 And that improvement is reflected in our recent survey, with only 17% of organizations reporting coordination with law enforcement as a challenge to fraud prevention. In a similar vein, a separate investigation conducted by the FBI targeted a California resident, who created synthetic identities, applied for credit, and added the fake identities as authorized users to credit cards belonging to individuals with high credit scores. The perpetrator then established bogus businesses to process credit card transactions for the synthetic identities under their control. Not surprisingly, they subsequently defaulted on repaying their debt. According to the FBI, five major U.S. banks bore the brunt of the losses. This underscores an important point: in order to remain undetected and maximize their takings, criminals rarely focus all of their efforts on one organization. And given the connected nature of today’s financial system and the ability of criminals to victimize companies simultaneously, successful prosecutions heavily depend on industry cooperation and collaboration with law enforcement. So whether conducted by a criminal gang or an individual, SIF challenges organizations to determine the difference between a legitimate identity and one that exists only in the minds of criminals. Ultimately, as the cases investigated by law enforcement show, the best way to detect and prevent synthetic identity fraud is with collaborative networks, law enforcement coordination, and a smart, multi-layered identity verification system. 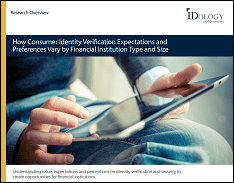 For more information, download the white paper Combating Synthetic Identity Fraud: Determining Fact from Fiction, which delves deeper into the issue of SIF.